The 7 Best Bagel Shops in Missouri! If you’re looking for the perfect, easy and delicious breakfast, Missouri has a variety of classic bagel shops to choose from. Whether you’re looking for a classic bagel with cream cheese or a breakfast sandwich, Missouri has it. From St. Louis to Kansas City, find all of your favorites at these great bagel shops across the state. With two local shops in the St. Louis area, Companion has been named one of the only places around to get an authentic bagel. They also have an array of other baked breads, pastries, and sandwiches, including daily specials and seasonal offerings, but one of the best things about them is their website. They offer recipes and cooking ideas, donations to community organizations, and a general sense of joy in giving to the community. It’s nice to buy a good bagel from good people! From New York to Kansas City, old world taste is exactly what Meshuggah Bagels has to offer. A moist center and a crusty shell, these boiled bagels will delight your family and leave you wanting more. Meshuggah consistently tops the lists of the best bagel shops in the KC Metro area. Originally a wholesale and retail bakery, Le Monde Bakery has recently expanded to include New York-style bagels. Along with traditional flavors like plain and sesame, you can more unusual offerings like blueberry and cinnamon. Step in for a coffee and a bagel and you’ll see why Le Monde is so popular with neighborhood locals. B&B Bagel is Columbia’s favorite bagel place. And little wonder: All of B&B’s bagels are made from scratch and boiled the old-fashioned way. Pick up a dozen at the drive-through window, or sit inside and enjoy one of their justly famous pizza bagels. A favorite hangout for students and townies alike. 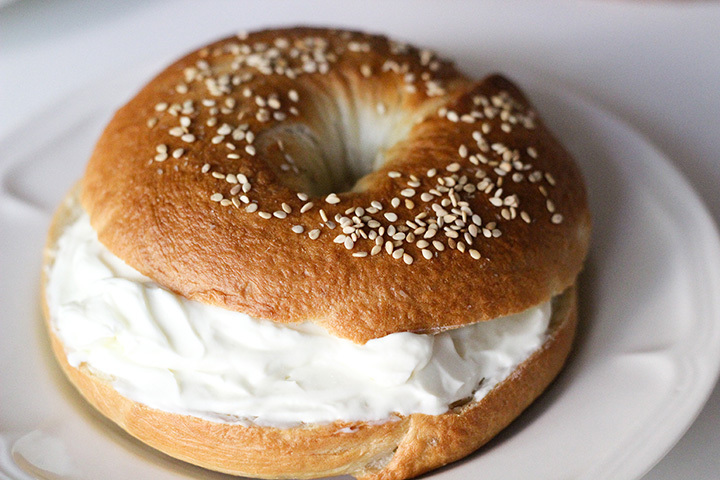 The Bagel Factory’s onion bagel has been called the single best bagel in all of the St. Louis area, and when paired with locally made Raskas cream cheese, offers a sublime bagel experience. The Bagel Factory is the place to go to grab a dozen delicious rolls to take to the office with you, but keep in mind they don’t take cards—so stop at the ATM for some cash on your way in. Both of the Eggtc. locations, one on the Kansas side and one on the Missouri side, have been named Kansas City’s Brunch for several years running. Eggtc. serves its bagels as part of a breakfast or brunch menu, either a la carte with rich cream cheese, with traditional and delicious lox, or as part of a breakfast sandwich. It’s your choice, but every one of them pairs up just fine with a Bloody Mary or mimosa.